Farewell to the B-Class Vessels. This year was a historical year for Brunei Gas Carriers Sendirian Berhad (BGC) where the last two B-Class vessels were decommissioned. This also marked the end of the provision of management services to Brunei Shell Tankers Sendirian Berhad (BST). BGC was established in 1998 and is a joint venture company incorporated in Brunei Darussalam by the Brunei Government, Shell Gas B.V and Diamond Gas Carriers B.V. Since BGC’s inception, the company has been a vital force in committing itself to delivering liquefied natural gas (LNG) cargoes to Brunei Darussalam’s international clients, safely and reliably. BGC’s vessels have made deliveries to Japan and Korea since 2002 and 2011 respectively, as well as other ports of call within the Asia Pacific region, namely Australia, China, Malaysia, Thailand and Taiwan. The B-Class vessels that consisted of seven ships have been operating in Brunei since 1986. They were initially referred to as G-Class to reflect their seashell names of Gadinia, Gadila, Gari, Gastrana, Gouldia, Geomitra and Genota. They were renamed by His Majesty Sultan Haji Hassanal Bolkiah Mu’izzaddin Waddaulah ibni Al-Marhum Sultan Haji Omar ‘Ali Saifuddien Sa’adul Khairi Waddien, Sultan and Yang Di-Pertuan of Brunei Darussalam after ownership transferred to BST in 1986. Now registered under the Brunei flag, the vessels were named after species of local fish and shellfish to maintain the marine connection and were thereafter known as Bebatik, Bekalang, Bekulan, Belais, Belanak, Bilis and Bubuk. 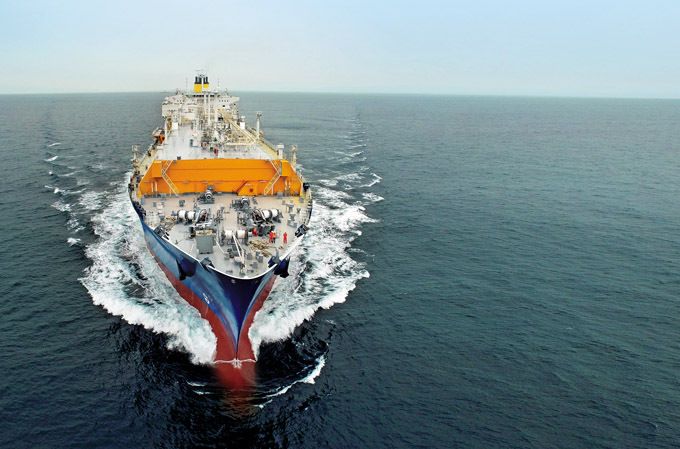 The custom-built and technically complex vessels each carried around 75,000 m3 of LNG and sailed the ocean routes between Brunei and Japan in a round trip loop. Over the course of almost 50 years, the B-Class vessels have continuously provided safe and reliable LNG shipping services to the Brunei LNG Project and their customers, completing more than 6,300 successful cargo deliveries without ever missing one, whilst navigating an approximate 4,000-kilometre route between Brunei Darussalam and Japan. That is over 75 times to the moon and back or 1,500 times circumnavigating the planet! It is a record that has been achieved quietly, but above all safely and reliably, and has become a model which other integrated LNG projects continually look to aspire to. The success of the Brunei LNG project and the associated opportunities it has afforded to the many Bruneian seafarers who have sailed on them to grow and develop – from an LNG shipping perspective – has been largely underpinned by the seven Brunei Shell Tankers’ B-Class vessels that provided such distinguished service to the project. Over 2,000 crew members have dutifully manned these ships tirelessly during the decades of service to BST and Brunei Darussalam, sacrificing time and family, spending weeks and months on end at sea to ensure each cargo delivery was completed safely. On several occasions, these ships played instrumental roles in rescue operations of other stricken vessels, treating wounded crew, feeding famished refugees and sending distress calls to international authorities. Even into their later years, the B-Class vessels maintained stellar safety, service and response records, a tribute to all those involved in their design, construction and operation – a feat that is unlikely ever to be repeated. Through the B-Class vessels, BGC now has its first few Master Mariners and Chief Engineers and with the end of them, that mantle has now passed to BGC’s A-Class vessels as BGC continues to develop its Bruneian seafarers in support of Vision Brunei 2035, befitting BGC’s vision of “Developing the nation’s resources for safe, reliable and sustainable maritime transportation”. To mark the end of the B-Class vessels’ era, BGC commemorated this important milestone with a ceremony in April 2018 to bid a final farewell for Bebatik and Belanak, which were both decommissioned in June this year. The ceremony was graced by guest of honour, Yang Berhormat Dato Seri Setia Awang Abdul Mutalib bin Pehin Orang Kaya Seri Setia Dato Paduka Haji Mohd Yusof, Minister of Communications, who also officiated the launch of the B-Class vessels commemorative coffee table book, “Finished with Engines”. The book was a labour of love and created to commemorate the people, the many achievements and changes BGC and BST have witnessed throughout the decades and the vessels which made up the fleet. Today, BGC owns five A-Class vessels namely: Abadi, Arkat, Amali, Amani and Amadi ranging from 137,000 m3 to 154,800 m3. Moving forward, BGC will continue its commitment to the country and the community and hopes to diversify its business in support of Vision Brunei 2035. BGC aims to do this by supporting ongoing developments and providing maritime expertise and be the leading developer of local shipping and maritime skills by 2020. There are currently no comments on THE END OF AN ERA. Perhaps you would like to add one of your own?